Over the course of the last year, I’ve watched the discourse around the global refugee crisis expand. I’ve watched as we’ve divided ourselves onto tidy teams. I’ve shared my opinions and perspective, on more than one occasion, and will continue to stand in solidarity with those seeking refuge from unimaginable horrors. I’ve listened, really listened, as those on the other team explain their fears when it comes to welcoming refugees. I’ve come to understand that many who disagree with me share my compassion for those in crisis, but differ in opinion on how to help. Unfortunately, I’ve also come to understand that others don’t share my compassion at all, but that those voices are the minority. I refuse to cast a broad stroke over those with whom I disagree – that kind of thinking is at the root of most conflict. So, I’m not writing today to try and recruit more members to my team (though, if you want to join, there are no try-outs and an unlimited number of spots). I’m writing today to speak directly to my teammates. Consider this a pre-game pep talk. 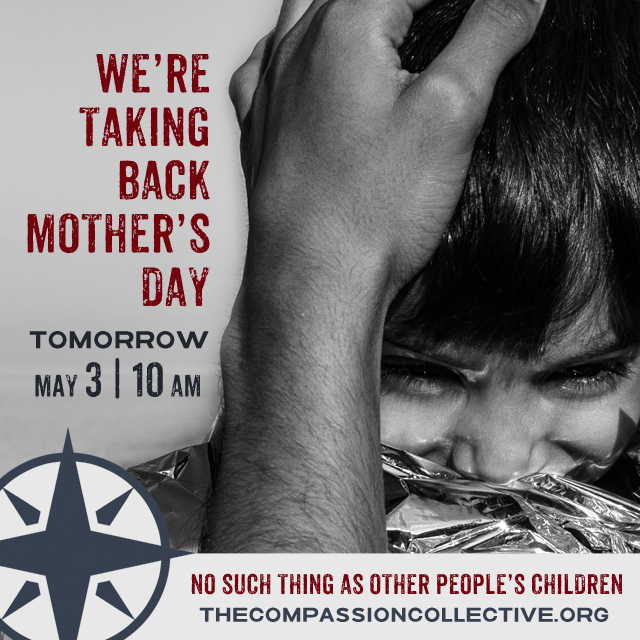 Team – if you aren’t already aware of the tremendous work that the Compassion Collective is doing, please start here. And if you are aware, and have donated to this effort, read the update and see how you are making a difference. The refugee crisis will not be solved by a singular government agency, or a non-profit organization. It is too big (but, unlike a bank, not considered too big to fail). It will be solved by a collective of individuals, agencies and political policies, and it will require small actions from large numbers of people. And it’s working. Right now, the funds raised through the collective are feeding 6,500 people. Providing tents. Lanterns. Cell phones. Water. These funds are literally saving lives. Funds raised by people like you and me in no larger than $25 donations. This past weekend, I attended a SCBWI conference on writing for children. I had the privilege of listening to Linda Sue Park, Newberry award winning author of A Single Shard, talk about the importance of story in transforming lives. She shared the story of Salva Dut, a lost boy of Sudan who came to the United States as refugee and orphan, was adopted, received an education and went on to found the agency Water for South Sudan. Linda Sue Park’s book, A Long Walk to Water, shares his story along with a fictional character, Nye, who represents the children in South Sudan. It’s a beautiful book, and one I recommend you share with your kids. I sat through her presentation blinking back tears, but when she shared that since the book’s publication, children around the US have collectively raised more than one million dollars for Water for South Sudan, they streamed down my face. Children all over this country, including those living in socio-economically depressed situations, were moved to action for their fellow humans. This is the power of story. Please read the stories of refugees. Don’t turn away. I know it is painful to imagine, but it requires our collective imagination to solve this problem. The Compassion Collective needs our help again. They need our small acts of great love. In the next hour or so, Glennon Melton and her team of love warriors (hint- that’s our team too) will be announcing a new initiative and we get to be a part of it. Are you ready? And let’s talk about that $25 donation, because I know for some of you, that’s not pocket change. It may require sacrifice. Skipping a meal out or a night at the movies. Or adjusting the meal plan for the week to include a couple nights of rice and beans. A couple less shirts for the summer wardrobe. I think those things are worth saving a life. I hope you do too. I’ll be back to share the link right here as soon as they announce their goal later this morning. But in the meantime team, let’s get ready for the game. It’s not going to be a short one. This isn’t a nine inning kind of deal. In fact, if you decide to be on the team of those who stand alongside refugees, you’ll be playing this game as long as you live. You may never see a final score. But you’ll see some home runs. You’ll see folks crossing the plate. And that has to be enough for us. It has to be enough to hold our own children tight, grateful that we don’t have to leave everything we know behind, and then take that gratitude and turn it into action for those who do. It has to be enough to get to play at all.